Political economist, b. in Philadelphia, 2 Sept. 1839. He went to sea at an early age, and, reaching California in 1858, remained there, becoming finally a journalist. In 1879 he published Progress and Poverty, which was issued in the following year in New York and London, and soon acquired a world-wide reputation. This book is an inquiry into the cause of industrial depressions and of increase of want with increase of wealth, in which the previously held doctrines as to the distribution of wealth and the tendency of wages to a minimum are examined and reconstructed. In the fact that rent tends to increase not only with increase of population but with all improvements that increase productive power, Mr. George finds the cause of the well-known tendency to the increase of land values and to the decrease of the proportion of the produce of wealth that goes to labor and capital, while in the speculative holding of land thus engendered he traces the tendency to force wages to a minimum and the primary cause of paroxysms of industrial depression. The remedy for these he declares to be the appropriation of rent by the community, thus making land virtually common property, while giving the user secure possession and leaving to the producer the full advantage of his exertion and investment. In 1880 Mr. George removed to New York. In 1881 he published The Irish Land Question, and in 1883-4 he made another trip at the invitation of the Scottish land restoration league, producing on both tours a marked effect. In 1886 he was the candidate of the United labor party for mayor of New York, and received 68,110 votes against 90,552 for Abram S. Hewitt, the Democratic candidate, and 60,435 for Theodore Roosevelt, the Republican candidate. Soon after this, Mr. George founded the Standard, a weekly newspaper, which he still edits (1887). He has also published Social Problems (1884), and Protection or Free-Trade (1886). The latter is a radical examination of the tariff question, in which connection is made between the controversy on that subject and the views as to land with which Mr. George has become identified. Appletons Cyclopædia of American Biography / ed. by James Grant Wilson and John Fiske. New York : D. Appleton and Company, [v.2], 1888. 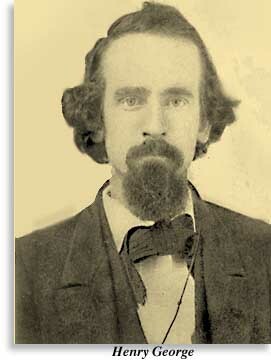 See: San FranciscoLabor for more about Henry George.